1. Quality of most body hair is not as good as that of the hair of the scalp. 2. Body hair ( except beard hair) are generally thinner in diameter . 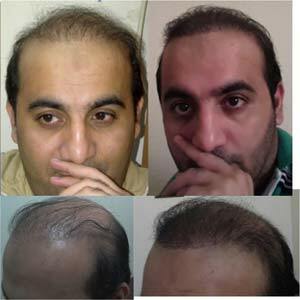 They grow for shorter length and they have usually one hair per root unlike the hair of the scalp which are thicker in diameter, grow longer and have up to 4 hair per graft. 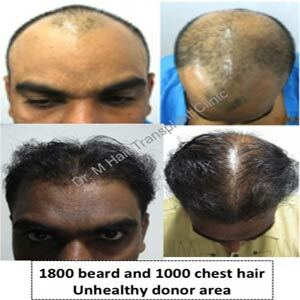 Therefore more BHT grafts may be required for the coverage of the same area compared to that of the grafts from the scalp hair. Nevertheless when BHT is appropriately indicated we generally recommend 2 things before procedure. to have more hair in anagen hair. 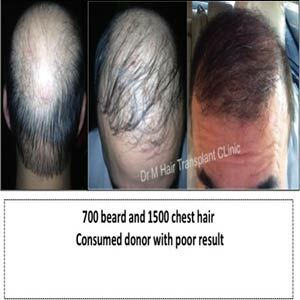 BHT is usually done in situation where normal donor area is depleted. Well you may be in similar situation. Nevertheless we must at least see the pictures of your chest, beard and back hair for quality and quantity. 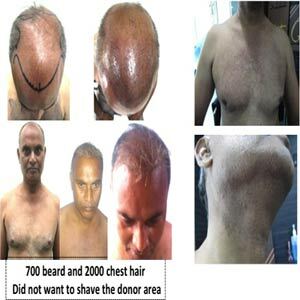 We generally do only anagen (Growing phase of hair cycle) hair harvest from the body for better outcome from survival point of view and for better initial synchronous hair cycling. We generally recommend 2 things before procedure. to have more hair in anagen hair. We generally recommend 2 things before procedure. to have more hair in anagen hair. 1. Apply 2% Minoxidil solution in the area at least once a day on the probable body area of harvest for a few weeks.